Fira Santorini: Fira is the capital of Santorini, Greece, and the most important of all villages. It is located at the west side of the island and 10 km away from the main port, Athinios. Fira has 1,600 permanent inhabitants. It is perched on the edge of an impressive cliff, at a height of 260 meters offering a great panoramic view over the submerged volcano. Fira is the capital of Santorini. On the caldera side you get one of the best views of the island. In 1956, the island of Santorini was hit by an earthquake that destroyed a large part of the island but luckily, some of the 18th century buildings were saved. The town of Fira is a typical Cycladic village made of charming white houses with blue windows and doors, separated from each other by small paved streets. Many of its beautiful buildings were constructed back in the times of the Venetian invasion, including some blue domed churches and sun-bathed verandas that offer an incredible view of the volcano and the sunset. In our days, Fira is a busy town. During summer and in its high season, the central streets are overcrowded with tourists and filled with all kind of shops, jewelleries, restaurants, cafes, bars and night clubs. The town has a large number of hotels and from a high position you can notice that most have swimming pools and verandas offering their customers a superb view. 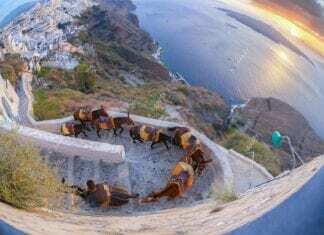 The caldera is considered the highlight of Santorini but there are some interesting churches that attract attention as well as the sheer beauty of the town’s architecture. Despite all the tourist traffic concentrated in town, there are some areas that remain quiet. Thus one will definitely find places to relax and enjoy a great view of the island and the surrounding area. 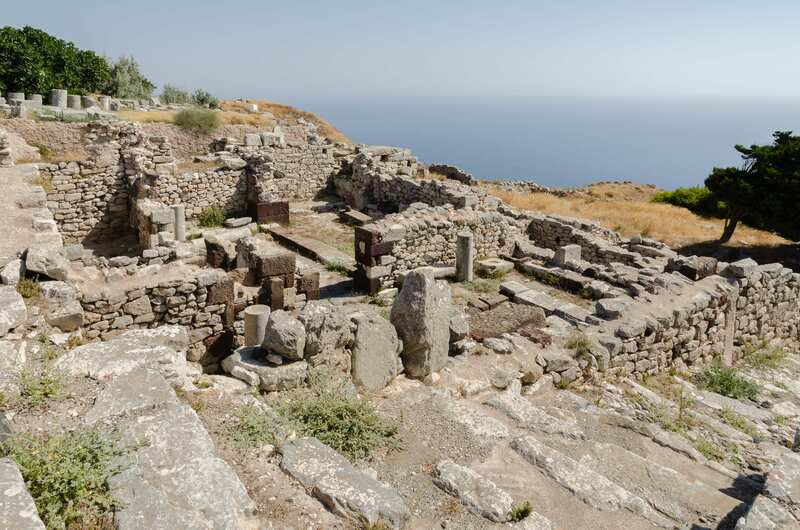 For those in search of a knowing better the culture of the island, an Archaeological Museum hosting many items from several excavations conducted in the ancient Minoan settlement of Akrotiri can be visited in the town of Fira. The town displays also numerous churches and monasteries such as Agios Minas, the cathedral of Ipapanti, the cathedral of Christ, the monastery of Panagia ton Dominikanidon, Panagia tou Rodariou and the Catholic Cathedral. A nice proposal is also the Megaron Gyzi Museum with its fascinating collection of photos of Fira before and after the earthquake of 1956. Fira also has a port that was, for many years, the main port of Santorini. Today, this port is only used for cruise boats. From there, boats can take visitors for a tour to the volcano of Nea and Palia Kameni.